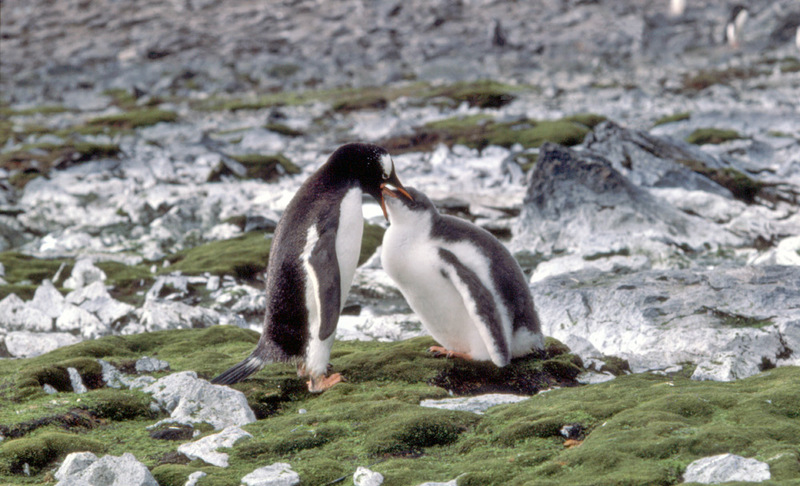 A parent gentoo penguin feeding its chick. The chick is very close to fledging judging by its size. Penguin chicks because they are covered in thick down before they gain their adult feathers frequently look bigger than the adults that they are feeding from, it's largely fluff though and once they shed the down and grow the adult feathers they seem to shrink a few sizes. This feeding is clearly taking place away from the main colony. As the chicks get bigger they beg for food from almost any adult that comes their way. It is only in the adults interest to feed their own chicks, so there is often a chase right through and away from the colony with much calling to each other while the adult establishes that this really is their chick. A feature seen in this photograph that surprises people is how green some bits of Antarctica can appear away from the snow and ice. This area is covered in snow and ice in the winter, but in the warmer months, this melts exposing rocks and an extensive carpet of moss (not grass), in other areas, large e4xanses of green turn out to be lichens growing on the bare rock.